I had a wonderful getaway camping with my son in the Waterton National Park last weekend. Along the way down there, I travelled through the Crowsnest Pass just as the sunlight was slipping off the peaks and giving way to the night. I stopped for a few minutes to enjoy the transition and this photograph is the one I made from the many peaks stacked around the valley. A mountain unknown to me but beautiful in its isolation. 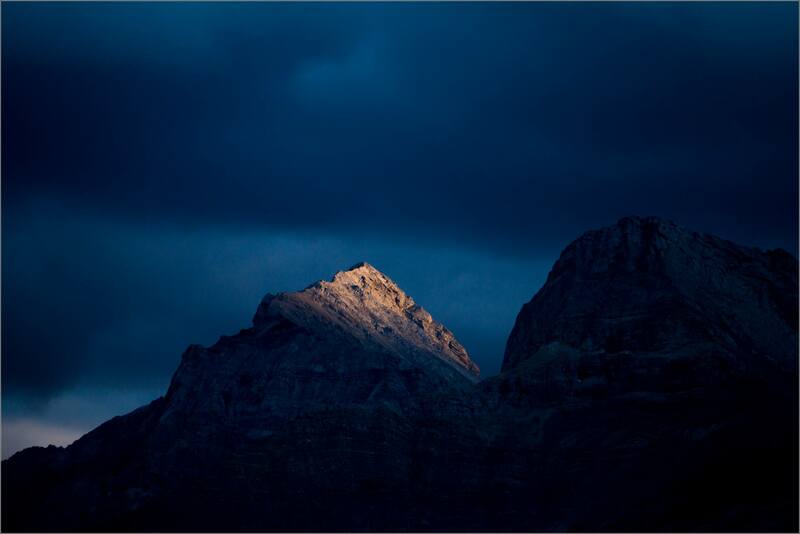 August 16th update – my Uncle Bill, Auntie Ann and cousins Chad and Darren, who lived in the Crowsnest Pass area for many years, discussed this peak and confirmed that it is Mount Tecumseh. Thank you family! This entry was posted on August 14, 2015 by Christopher Martin. It was filed under Alberta, Landscapes, Sunset and was tagged with alberta, Canada, Crows nest Pass, dusk, isolation, landscape photography, Rocky Mountains, sunlight. Great photo, Chris! Could I ask about your settings? Hi Svetlana. Thank you! I used a Canon 5DIII, Canon 300mm f/4 lens: 1/800 seconds, f.4.0 on ISO 500. I wanted the depth of field to be as small as possible (still quite large given the significant distance from me to the peak) and needed a higher shutter speed as the wind was blowing hard (as is often the case in the Crowsnest Pass) and I did not want to set up my tripod for this one – at ISO 500, I had no concerns about losing detail. I hope you are enjoying a great weekend! Thank you Lisa – the clouds, mountain and sunlight made this one a pretty straightforward capture.